Agra which was developed in the period of Mughal during the 16th and the early 17th centuries and here one can witness the architectural splendour of the mausoleums, the fort and the palaces of the Mughal empire. Though the city is little congested it is known for its craftsmanship of marbles and soapstone. The city is inlaid with extraordinary monuments and history. Agra is one of the most favourite tourist spot forming the 'Goden Triangle'alond with Delhi and Jaipur.The city is also famous for its carpets, gold thread embroidery and leather. In Uttar Pradesh Agra lies on the banks of river Yamuna.On the North it is bounded by Mathura and by Dhaulpur in the South.Firozabad and Bharatpur forms the boundary in the East and the West respectively. It experiences both the extremes of climate in the summer and winter. Agra which is even mentioned in Mahabharata as Agravana is noted for its historical monuments. During the period of Aryans Agra was called as Arya Griha.The name Agra was first mentioned by Ptolemy and its glory was at its peak during the reign of Akbar, Jehangir and Shah Jahan.In fact in 1558 Akbar aid the foundation of the modern city which we see now, and he developed and praised the culture, art and commerce. The buildings and the monuments which belong to the period of 16th and 17th century were built in the contemporary Mughal style. The natives of this place are mostly skilled craftsmen. The most common festivals celebrated in Agra are Eid-ul-Fitr, Eid-ul-Adha, and Muharrum whose dates vary every year. These festival seasons are known for its Id mela. Diwali another common festival of lights is celebrated with the same enthusiasm as the rest of the country. The most common cultural festival celebrated here is the Taj Mahotsav which highlights the finest Indian crafts. AS part of celebrations you can witness various competitions like folk music, poetry, classical dance performances, decorated elephants and camels. This is also accompanied by the Taj food festival. There are exhibitions on marble inlays, wood carvings, brass and metal ware, handmade carpets, the blue pottery, the Chikan works, Banares Silk etc. AGRA FORT-This is a very vast monument on the banks of river Yamuna.This fort is occupied by number of palaces, mosques and gardens in its campus. MAUSOLEUM - This mausoleum of Akbar which is just 4kms away from the city is a blend of Hindu, Christian, Islamic, Buddhist, Jain traditions. CHINI-KA-RAUZA - This is a tomb built to honour the poet and scholar, Allama Afzel Khal Mullah Shukrullah of Shiraz. ITIMAD UD DAULAH - Taj Mahal was the replica of this tomb which features the silver jewel box in marble. It is the tomb of Mirza Ghiyas Beg, the father of the Mughal Empress Noor Jahan.This is quite different from the other tombs of the Mughal dynasty for it followed the central Asian geometrical pattern of construction with gardens and waterways. MANGALESHWAR TEMPLE-This is a quite famous temple and is located in the Gokal Pura area and well connected to the city by the Ramratan Road. This temple reflects the religious diversity of Agra. BAGESHWARNATH TEMPLE - This temple is 2kms away from the city centre and is located in the civil lines which are in the northern part of Agra. The city of Agra is also dwelled with St. John's Church, St. Mary's Church and St. Peter's Church and all these are centrally located. 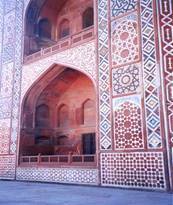 This is situated in the Agra Fort Complex which is very close to the Yamuna river. The masjid is well connected by buses and trains. It is also refferd as Pearl Mosque. The Moti Masjid built by Shah Jahan is featured by three marble domes, resting on the red sandstone walls. This mosque is one of the largest of its kind in India built in 1571 A.D., located in Fatehpur Sikri.The most reputed and famous Buland Darwaza is the main entrance to the mosque. The mosque is known for its lattice screens with intricate works like paintings, inlaid stones, carvings and glazed tiles. It comprises of a huge courtyard which includes the tombs of Royal Ladies, Islam Khan, Sufi shrine and Sheikh Salim. This tomb is located in a place called Sikandra which lies on the road to Delhi. 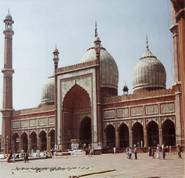 It is known for its elegant minarets inlaid with white and coloured marbles along with floral decorations. 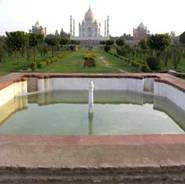 This is also known as moon lit garden for the reflection of the Taj Mahal falls in the pool of the garden at nights. This is built in a typical Charbagh fashion and history says that it is in this garden Shah Jahan wanted an identical one for himself. The place is enriched with more than 40 varities of blooming plants. It just lies 2 kms away from Taj Mahal. This museum which is located near the Taj Mahal Complex and it is one of its kind which talks about the heritage of Agra. This was mainly built for a movement called 'Brahma Kumaris'.The museum houses many shapes, colors and forms that tend to explain various physical phenomena. This epitome of symbol of love was built by Shah Jahan in the memory of his beautiful wife Mumtaz Mahal. Taj Mahal was the culmination point of Indo-Persian architecture. It is built on the banks of river Yamuna.Shah Jahan was very fond of buildings and he loved construction. It is a place which should not be missed by anybody visiting this place. 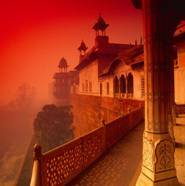 The Agra fort which is centrally located is a red sandstone building. This was initially built for the military but later during Shah Jahan's period it was converted partially to a palace. 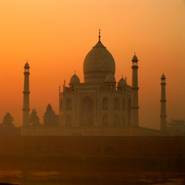 Taj Mahal was the replica of this tomb which features the silver jewel box in marble. It is the tomb of Mirza Ghiyas Beg, the father of the Mughal Empress Noor Jahan.This is quite different from the other tombs of the Mughal dynasty for it followed the central Asian geometrical pattern of construction with gardens and waterways. This is a tomb built to honour the poet and scholar, Allama Afzel Khal Mullah Shukrullah of Shiraz. He was also later the prime minister for Shah Jahan. This was built by Shah Jahan in 1648 and is situated in Fatehpur Sikri which is about 37kms from Agra. The main entrance to this mosque is known as Buland Darwaza and the absence of minarets and the shape of the dome give it a distinguished character. This tomb is located on the Delhi- Agra highway. It was built in 1611 and it was dedicated to wife of Akbar Md sand stone tomb. 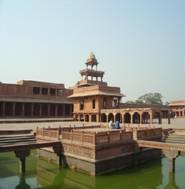 The town of Fatehpur Sikri was initially supposed to be the capital of the Mughal Emperor Akbar,is about 37kms away from the town of Agra.Fatehpur Sikri was built during 1571 and 1585. Mathura which is a small town is about 58kms from Agra and if one travel from Delhi it comes even before Agra. It is the birth place of Lord Krishna. The National Chambal Sanctuary, located in Etawah, near Agra is spread over an area of 635 sq. kms. There are no foreign embassies located in Agra, but the nearest one is in New Delhi. A shopper's paradise for those who love to buy specialties of the place as souvenirs and keepsakes or as gifts for their loved ones. Sadar Bazaar, Kinari Bazaar and Munro Road - leather items and marbles. Gangotri, Taj Mahal Complex - leather handicrafts. Shilpagram crafts village - leather, wooden handicrafts, rugs and carpet. Raja Mandi, Fuhaara and Lohamandi - Zari embroidery work textiles, stone inlay marble work, durries and carpets. Agra is equipped with a domestic airport at about 7 Km from the city. It has regular chartered flights of both government and private airways from major cities. There are daily trips of to and fro flights from Delhi and varnasi. Agra is very well connected to the capital city Delhi by broad and meter gauge railway lines. They are also added up with luxury trains like Palace on wheels with highly sophisticated saloons. Also many trains from other parts of the country pass through Agra. Through road Agra is just about 204kms away from the capital of the country. The national Highway from Delhi to Agra is very well maintained by the government and it roughly takes around 4hrs to reach from Delhi. Apart from the government and private travels you can also drive down by luxury cabs or taxis. There are two bus terminuses in Agra and they are Idgah bus stand and Agra Fort bus stand.